Frozen and burst pipes are some of the most common disasters that can happen to a household, especially during winter. When temperatures drop below freezing, water in the pipes in your home can freeze and begin to expand. This expansion can apply enough force inside the pipes to cause them to burst. 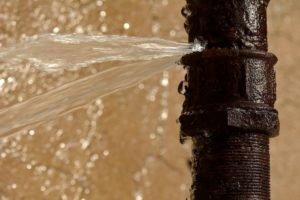 If you don’t catch the burst quick enough, the leaking water can cause serious damage to the drywall, flooring and belongings in your home. ServiceMaster Fire & Water Restore by GM’s technicians are available 24/7 and can be at your property within 2 to 4 hours of your initial call. We understand the time sensitive nature of water damage situations, so count on us to restore your property and peace of mind. When our team arrives to your property, they will immediately identify the affected area and assess the extent of the damage. The technicians will then create a custom remediation plan to eliminate the water damage as quickly and efficiently as possible. Once the plan is decided, we will begin the water removal and drying process to ensure your home is dry from top to bottom. We will keep you updated and stay in communication throughout every step of the process. How Can I Avoid Frozen Pipes? Before winter begins, make sure to remove and store any outdoor hoses. It’s also important to use spigot covers to protect exterior faucets. During periods of extreme cold, be sure to leave your cabinets open so warm, heated air can reach the exposed pipes. Take some time to check all windows and air vents; seal any gaps you see around exposed pipes. Never set your thermostat lower than 55 degrees Fahrenheit, even if you are planning to be away for the day. During periods of extreme cold, let cold water drip from the faucets utilizing the exposed pipes. Add additional insulation, like foam rubber or fiberglass sleeves, to any pipes you find without proper insulation. Trust ServiceMaster Fire & Water Restore by GM to help you when you need it most. We have the expertise and resources to properly handle water damage caused by burst or frozen pipes. Call us today, we are ready to help!